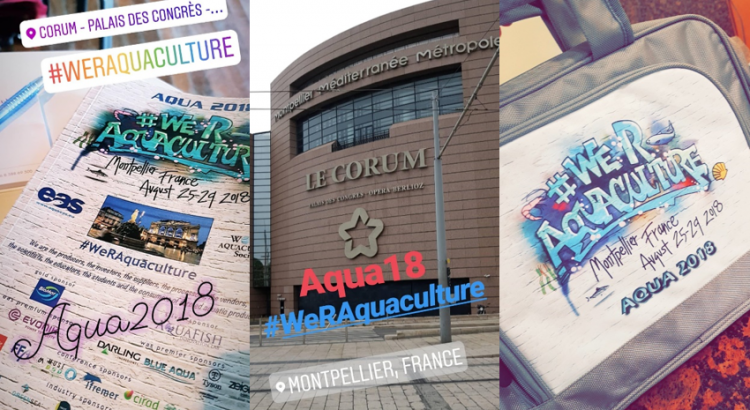 The World Aquaculture Society (WAS) and the European Aquaculture Society (EAS) host a joint global aquaculture event every 6 years which was hosted this year in Montpellier, France, entitled AQUA 2018. 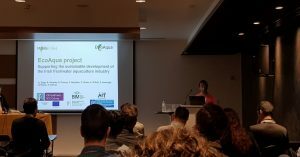 This conference discussed and explored the fact that aquaculture is one of the most important food industries in the world, and showcased all the research and development that are ongoing globally to help enhance this industry. The conference slogan #We R Aquaculture was aptly chosen to highlight that we are the producers, the investors, the scientists, the technical advisors, the legislators, the educators, the students, the suppliers and the consumers of farmed aquatic products. The conference opened with the 2018 State of World Fisheries and Aquaculture to give an insight into the latest trends in global aquaculture. The conference proceeded over the course of the 5 days with presentations and talks in an abundance of areas such as Recirculating Aquaculture Systems, Biosecurity and Antimicrobial Resistance, Marine and Freshwater Crustacean Culture, Feed Additives and Measuring Sustainability in a Changing World, to name a few. The conference trade show was open from the 26th to the 28th with just under 200 exhibitors present. Two of the members of our MOREFISH & ECOAQUA teams, Alex and Sarah, presented information about the background of both projects and gave a detailed insight into an ongoing area of research with one of our collaborating freshwater fish farms, Keywater Fisheries. 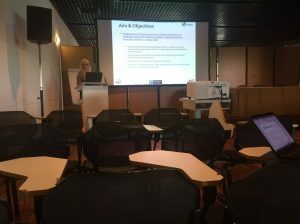 The vast amount of research that has gone underway in the aquaculture industry is phenomenal and that research only continues to grow, as evident by the variety of talks, posters and conversations that were imparted in Montpellier. The conference was both informative and enjoyable, and has led to many new connections for our team. We look forward to Aquaculture Europe 19, which will be hosted by EAS in Berlin, Germany from October 7th to 10th 2019. Sarah Naughton presenting on her work on the development of real time profiling of biological communities in freshwater aquaculture. Words and images by Sarah Naughton.